I like traveling, I think many have same habit, but I am not rich so sometimes I need save every penny while I traveling. Maybe that point is not only for me, maybe many people have same situation. 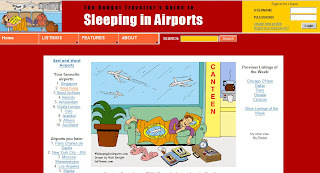 Sleeping In Airports is an online traveling guide that introduce budget travelers to sleeping in the airports. Sounds very interesting! Actually, it is an airport guide that shows you over 5000 airports information, what equipment they have, how traveler feel, and where is good place for take a nap. It lists top ten best and worst airports. You can check airport by regions: Europe, North America, Central & South America, Caribbean, Africa, Asia, and South Pacific. You can also find some tips for sleeping in airport, and some funny stories.